I’ve just been practicing a lot. That’s kydex from the inside of my holster embedded in my slide. I’ll take this over a fancy paint job any day. Been getting probably 200 dry fire draws every day and this is starting to happen after a couple weeks of being on a solid dry fire routine. Pretty much exactly how the slide of my G19 looks right now, can’t see it in your pic, but my corners are all silver instead of black too. When someone I don’t know shows me their gun, wear on the slide or frame is the first thing I look for to see if they are a serious shooter, or actually train. I’m up in Delaware right now, in the Army, but I am getting out soon and can’t wait to come back home to Raleigh and join yall at a match. Keep up the good work with the blog and podcast! 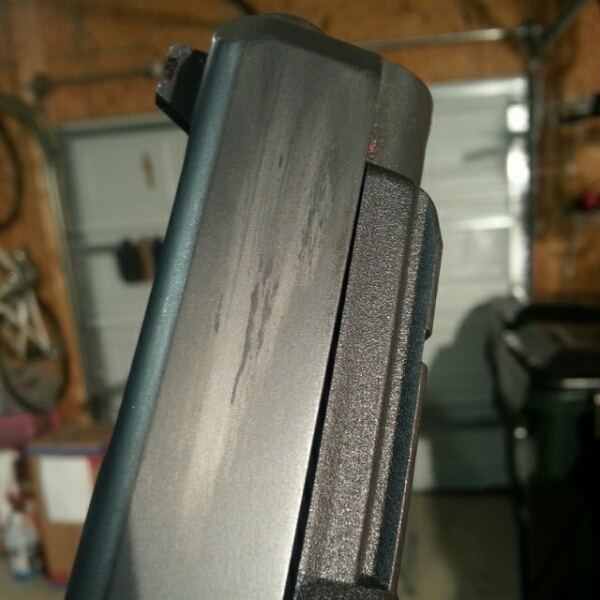 I’ve got silver peeking out all around the front bevel of my G34. I’ve never seen the effect shown in your picture. I used an Uncle Mike’s holster for my dry fire practice, and though they say it’s Kydex, I wonder if it’s not just injection molded plastic that’s harder on a gun than Kydex. I agree with Jon; when I run into people at the range and they start talking up their mad skillz, a glance at their handgun usually tips you off one way or the other (as if we all weren’t going to know the truth once the firing starts).